Love and hate are learned. What do you teach your children? I teach love. I also teach the right to defend yourself when physically attacked. But love is first. Human nature is such that we fear what is different. If that fear gets linked to individual hurts that are internal one, hatred brews. Here are five common examples of what I mean by internal hurts. You judge yourself as less smart, less strong, less talented than a person of difference. You have less wealth than a person of a difference. Your view of your higher power is challenged by theirs. A person of difference beats you in a race, a game. A person of difference seems more respected by others than you feel respect you. Hatred brews more easily when the voices around you promote hatred and join hands with your personal hurt. The more voices preaching hate, the easier it is to justify your hate. Some cultures raise their children on hatred of difference. Some do it directly. Go here to see what one group teaches its children. Others do it less directly. How? Think of any group that says those who believe differently are damned and doomed to spend eternity in hell. Also think of media messages that promote competition or divisiveness. I think of the Long Island Railroad mass killer Colin Ferguson as someone whose hatred festered because of failed dreams, personal hurts, the slings and arrows of thoughtless other people, and of the preachings of hatred. Born in Jamicae he came to the USA expecting to find great success, freedom and tolerance. He did not find success, he found racism, and heard the preachings of hate groups. It is a testimony to the goodness of most people that meeting with the same conditions, they do not turn murderous. What can a parent do to foster tolerance? Root out prejudice in your heart. Root out prejudice in you country. To remind yourself of the importance of learning love, download todays free poster coach about learning love and post it where you and your children will see it. 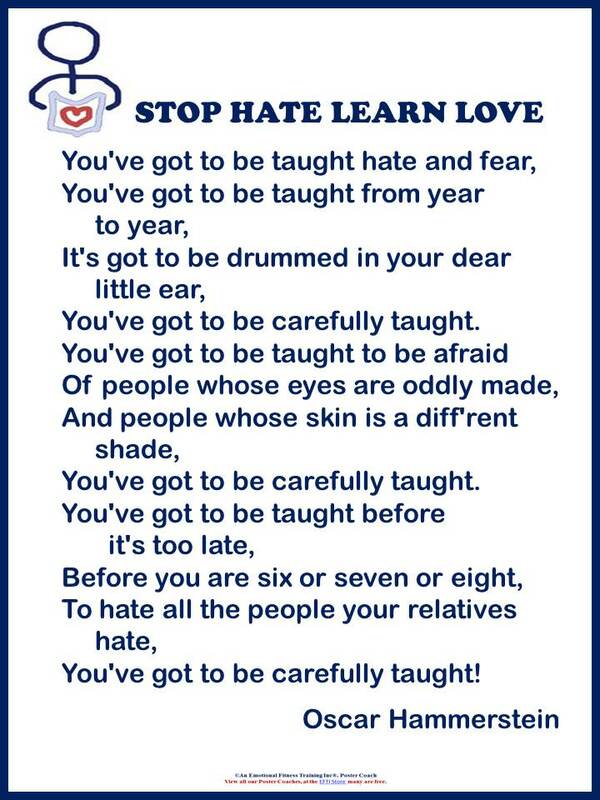 The more you have been taught to hate, the harder it will be to learn love and to teach your children to let go of the hatred of difference. Nevertheless, if your children are going to survive and enjoy a good life, the world must learn love. Make working to teach love one of your life’s missions. Improving your self soothing skills will also help. Thank you for all you do, enjoy and be grateful for all you have been given, practice kindness, like, share or comment. This post relates to this DAILY PROMPT : Object Lesson – Sherlock Holmes had his pipe. Dorothy had her red shoes. Batman had his Batmobile. If we asked your friends what object they most immediately associate with you, what would they answer? I would hope mine would be the peace symbol. IMAGE BY Emotional Fitness Training, Inc. Free download. This entry was posted in Emotional Fitness (Emotional Intelligence) Tips, Parenting Issues and tagged Emotional Fitness Training, Emotional Health, emotional intelligence, Hate, help for parents, how to parent, Katherine Gordy Levine, Parenting advice, postaday, Prejudice, Teaching Tolerance, Thinking about what matters. Bookmark the permalink.